Global demand for fine Asian works has led to outstanding prices in all categories. 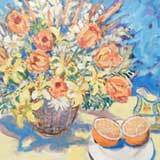 Rafael Osona Auctions is accepting fine consignments from all periods of the China Trade and Asian Arts. For over 30 years Rafael Osona Auctions have offered fine examples of 18th & 19th Century Asian artifacts readily found on Nantucket due to the early shipping commerce we shared with the East. Whether found locally on Nantucket, New England, New York or the West Coast, we have achieved great success selling China Trade ship portraits, whaling Captain portraits painted in Canton, Export porcelains & furniture, Chinese jades and hardstones, textiles, etc., for our consignors. Chinese Export Oil on Canvas “Starboard Portrait of the Nantucket Ship Midnight, Captain George H. Brock, Master, Sailing Into Hong Kong“, Chinese, circa 1850, attributed to Hin Qua (Chinese 19th c.), in period Chinese Export Chippendale frame with gilt slip and original Hong Kong frame and canvas, Merchant’s label on reverse. “From Brant Point to the Boca Tigris,” July 9 1994 – October 15 1994. 24 ¾ in. x 34 ¼ in. 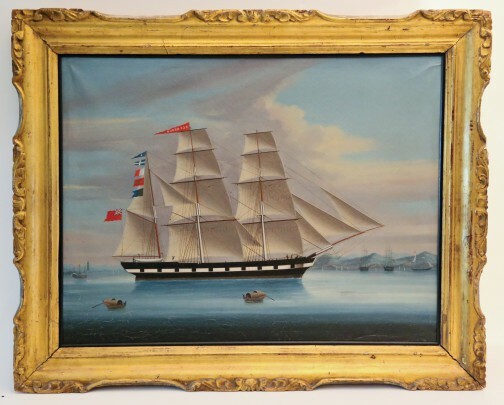 19th Century Chinese Export Oil on Canvas “Portrait of the American Ship Olustee” in period carved Chinese export frame. 17 ½ in. x 22 ¾ in. 19th Century Chinese Export Oil on Canvas “Portrait of a French Ship Entering Hong Kong Harbor” Inscribed lower left in the ocean “Notre Dame de Bon Port, Anne 1871″, in period Chinese Chippendale frame. 17 ½ in. x 23 in. 19th Century Chinese Export Oil on Canvas “Portrait of the Ship Recorder off the China Coast”, in period Chinese gilt frame. 17 1/2 in. x 22 1/2 in. Lai Fong (Flourished 1870-1910) “The British Clipper Bann in Moderate Seas, a Steam Vessel Beyond”, oil on canvas, signed and dated lower right Lai Fong Calcutta 1898. 25 ¼ in. x 34 in. 19th Century Chinese Export Oil on Canvas “Portrait of The Ship Arrow in Hong Kong Harbor” by Pun Woo, 17 ½ in. x 23 ½ in. 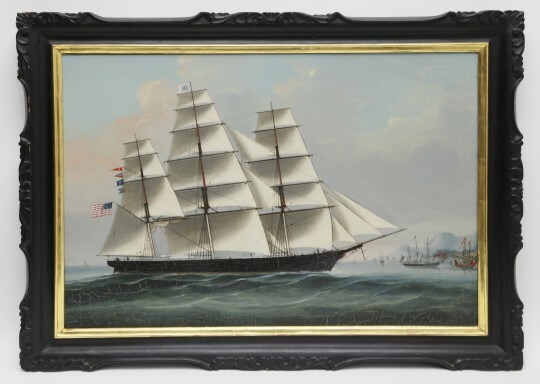 Lai Fong (Flourished 1870-1910) 19th Century Chinese Export Oil on Canvas “Portrait of an American Ship Entering Hong Kong Harbor”, Signed Lower Right Lai Fong, in Maple Frame. 24 ¼ in. x 33 ¾ in. An unsigned oil on canvas portrait of Hou Qua seated in an interior with landscape view, the frame hand decorated in an Asian motif. 24 in. x 18 12 in. Circa 1850-1880. 13 ½ in. x 10 ½ in. Mid 19th Century, original frame. 25 in. x 38 in. Paneled vases depicting a wraparound family scene on a terrace centering around the harvest; the neck with landscape and bird medallions. H 12 ¼ in. Chinese Blue and White Porcelain Chargers, 18th Century. A dragon emerging from a rough sea, intertwined around the neck of the vase holding a crystal ball, signed upon the base. Height 30 in. Well and finely carved leaf formed water coupe, decorated with detailed curled leaves and stem meandering to rim; the white jade with some areas of russet skin remaining, conforming open work fitted wood stand with silver Greek key inlays. H 1 ¼ in. Each figure seated on double lotus pedestal, clad in princely attire including a dhoti that wraps around their waist and between their legs; a sash is wrapped over the dhoti; both wear elaborate jewelry and crown, long earrings, necklace with large pendants, bracelets and belt. Heights 6 ¾ in. and 6 7/8 in. Fine Mogul-style Pale Celadon Jade Flatten Baluster Vase and Cover, 18th Century. Height 10 in. The stone with striated russet inclusion finely carved with a sage seated facing forward, in long robes, a long, incised beard and moustache and a characteristically large cranium, holding a gilt bronze vessel in his left hand, seated among a group of recumbent rams, the largest in front of the sage with 2-long sharp horns, 4 smaller rams lying amongst the ram, the remaining rams reclining in the group on fitted double wood stand. Length 7 in.